Linda Strachan lives near Edinburgh and knows a good story. Her own work ranges from the charm of her Hamish Mc Haggis picture book series through to strong teen novels such as Spider, (Winner of the Catalyst Award 2010) and Dead Boy Talking. She also wrote a useful handbook for people interested in this market: "Writing For Children". And so begins the first book in Cathy MacPhail’s new scary thriller series. 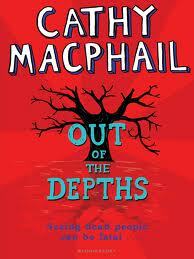 Cathy MacPhail is a consummate storyteller and in Out of the Depths she weaves a ghostly tale of murder and suspense around her main character which makes you hold your breath as you turn the page, desperate to find out how it will all end. Tyler Lawless can see dead people but it causes her no end of trouble. She had to leave her last school because no one believed her and she is determined that she is going to make a fresh start at her new school. She even tries to ignore it when she hears about a boy who died her new school, until the dead boy appears in her classroom and strange things begin to happen, again. Trying to make new friends Tyler is determined not to believe her eyes when statues come to life, putting it all down to her vivid imagination. But when the boy appears to her and seems to be asking for her help she wonders if she will be able to find out wht he wants. It all goes from bad to worse as her friends and everyone around her suspects that she is just telling lies and seeking attention. But Tyler knows that she has to help the boy that no one else can see. Out of the Depths is a wonderful blend of thriller and ghost story and Tyler Lawless is a feisty and dauntless heroine. This is a series not to be missed. Format: Paperback. Also available for Kindle. What a brilliant review, even if I say so myself!